Compared to its siblings, Embajador Supreme Añejo is a big, big brother. Rested for 18 months—a full 10 months longer than its Premium Reposado—Supreme is a veritable post-grad student compared to its primary school brothers. But don’t despair or stop reading now, patience has its rewards. Proceed apace. The nose produces aromas of roasted agave, cherry and even a pleasantly sour orange curacao, which I dug. Like Thanksgiving turkey, it’s fun just to sniff before inevitably giving into tasting. Though not overly assertive like some añejos, the flavor is delicious, offering up abundant wood notes tempered by cocoa, ash, toasted oak, caramel, floral tones and honey. Simultaneously sweet and vegetal upon entry, its texture becomes weighty at mid-palate and especially when moved around the mouth. There’s briefly nougat-like density at midpalate that fades quickly to honey before skulking off to a slow and delicate finish. The exhale practically ignites notes of rose and lavender, providing insight into the wild yeast influencing its ferment. 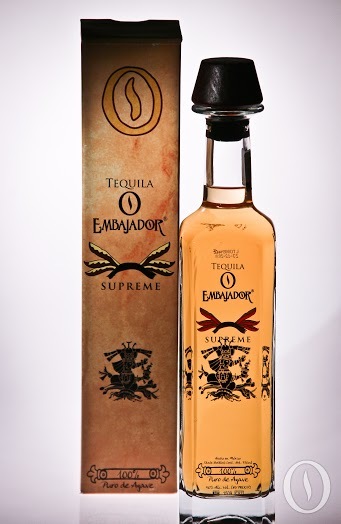 Having now tasted its full line, it’s clear that Embajador wants its tequilas to finish fast. Perhaps that bids drinkers back to the glass for more or leaves them searching for lingering, pleasant flavors? I don’t know. But none of the three offerings give much of a goodbye. Such a rapid departure isn’t an insult, however, it’s just different. And to be fair, I’m also a bourbon drinker who loves a high-proof palate punch, which isn’t for everyone. As proven by the success of Avion tequilas, there’s an abundance of drinkers who enjoy light-bodied sippers, and this would certainly fit that profile. Distiller’s note: Supreme is best enjoyed neat at 68 F.
T equila Aficionado is proud to welcome rising star in tequila and travel journalism, Stephen Coomes, as a Contributing Writer and Reviewer. His steady gigs include roles as contributing editor for Nation’s Restaurant News (the U.S. restaurant industry’s largest publication), restaurant critic and feature writer for Louisville magazine, feature writer for Edible Louisville and Seafood Business magazines, Kentucky travel and dining contributor for Southern Living, and dining blogger for Insider Louisville. He also writes marketing, PR, web copy and ghostwrites for numerous private clients. You can visit Steve online atwww.stevecoomes.com.